Valley Harvest Nut Company | The Best California Almonds Straight from the Farm to Your Table. 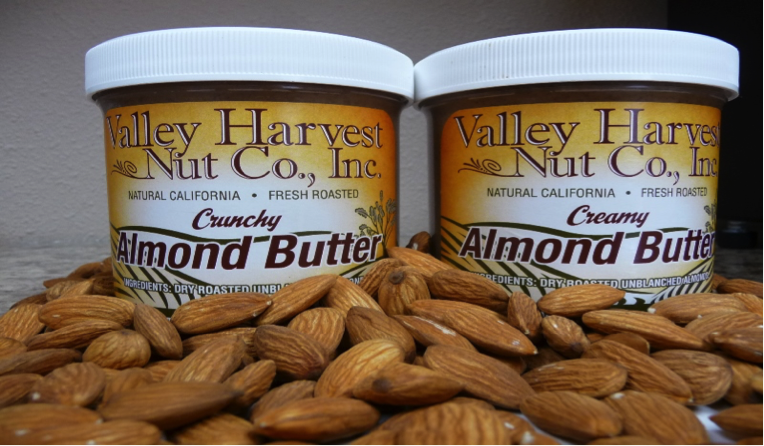 Valley Harvest Nut is a grower-based business, purchasing almonds from many area growers. The plant operation includes manufacturing equipment and markets blanched and natural almond slices, slivers, diced, splits, flakes and meal. Valley Harvest Nut is one of the few handlers to market creamy and crunchy almond butter. In addition, Valley Harvest Nut offers roasted almonds and several different flavored almonds. The plant also offers custom manufacturing for other almond handlers in the area. Valley Harvest Nut is a certified organic processing facility and is Kosher certified. Valley Harvest Nut Company now markets four to five million pounds of almonds each year on domestic and export markets. Prepare yourself for a tasty treat – bring Almond Butter to your table! Almond butter has a delicious and subtle taste to compliment your breakfast, lunch and dinner. Enjoy the new taste and the fantastic health benefits of this great nut spread and bring special culinary touches to your cooking. Valley Harvest Nut suppliers are located in a variety of California almond growing areas. This helps to insure a continuing almond supply from season to season. Valley Harvest Nut has a history of high grower returns and timely payments. Our conservative marketing philosophy, combined with a variety of quality products, makes us a partner you can trust. Click here to find out why it pays to become a Valley Harvest Grower. © 2016 Valley Harvest Nut Company.